When you take a trip to New York, do not let it end only in Manhattan. 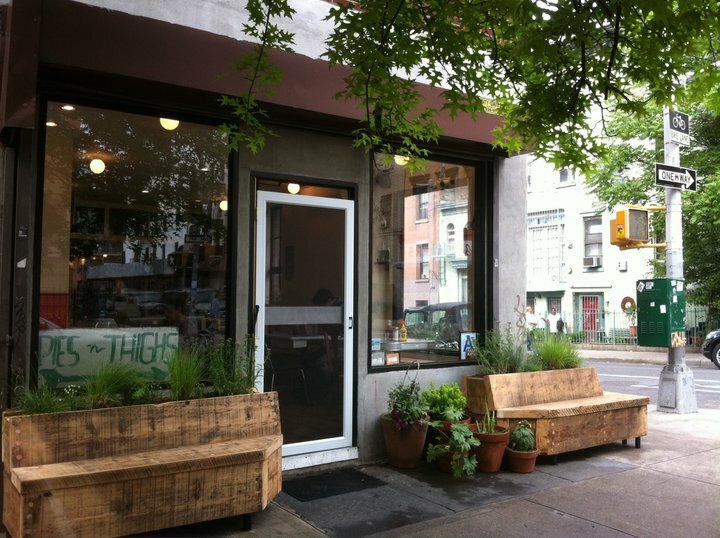 There is a true gem in Brooklyn which worth traveling for. 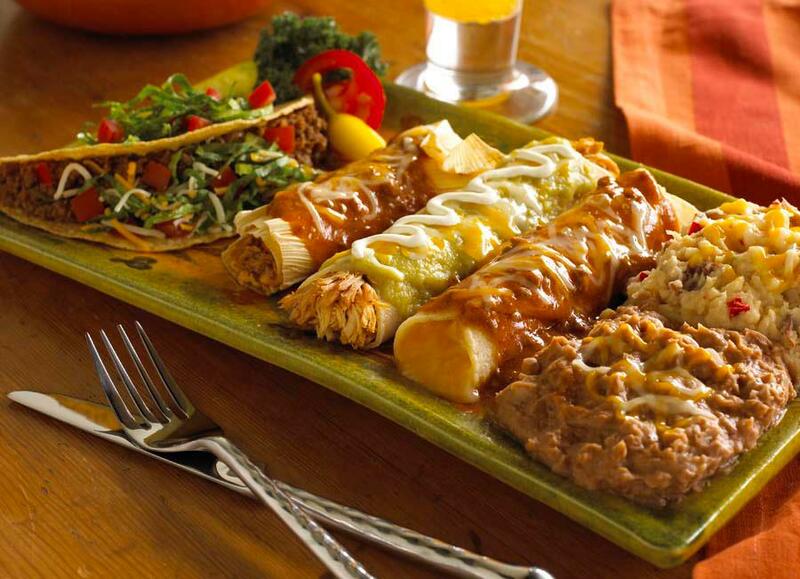 The place is called Pies ‘n’ Thighs, which is a restaurant offering Southern food with twists of Mexican. You can enjoy both savor foods and desserts there. Their signature menu, Fried Chicken, definitely goes beyond your expectation and you will love it! Pies ’n’ Thighs opened his door in the shadow of the Williamsburg Bridge in 2006. They are family friendly restaurant and support Slow Food movement which aims to sustain local food cultures and traditions. Hence their ingredients are the freshest and mostly U.S. products. Furthermore, their dishes have been gotten many compliment from various media. “Best Donut in New York” by New York, “Best Biscuits in New York” by the New York Daily News, and “Best Apple Pie and Best Fried Chicken” in national surveys by Food & Wine and Bon Appétit. 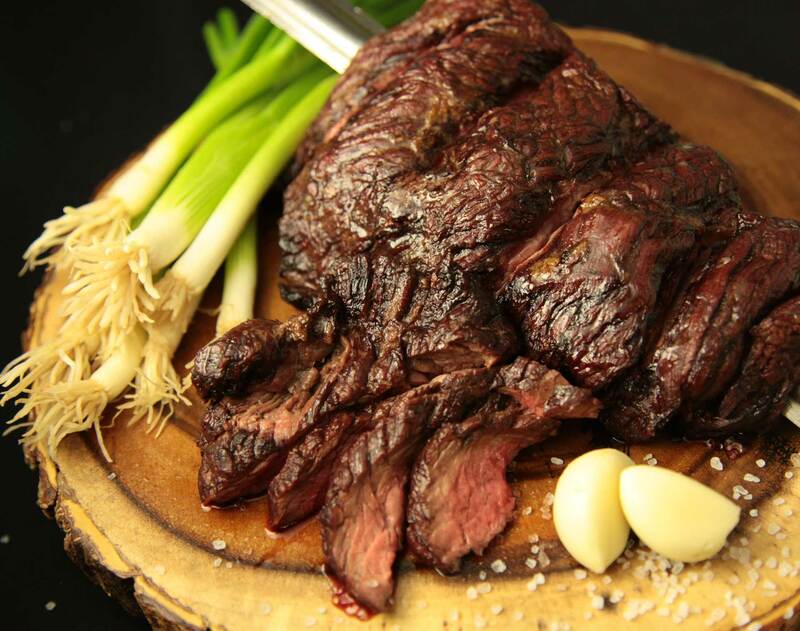 Their high quality of foods are widely and publicly acknowledged. Needless to say, their signature menu is Fried Chicken. They have some menus which emphasize on Fried Chicken. Let’s see each of them. First one is Chicken and Waffles, this seems wired for people not from south part of U.S., however it is a standard way to enjoy Fried Chicken in this way there. It is something new to try sweet and savory together and this is what new people at Pies ‘n’ Thighs should try. 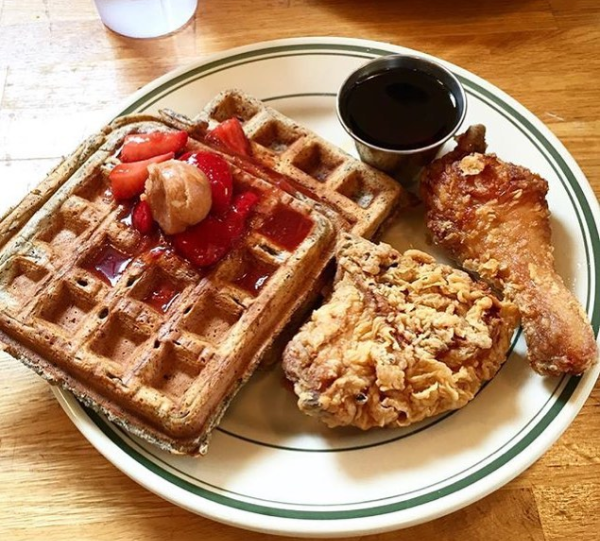 Chicken and Waffles has two pieces of fried chicken and two buckwheat waffles topped with cinnamon butter & strawberry. You have no idea how it tastes and it is not easily explained, but it really works and crispy, not oily fried, chicken goes well with fluffy waffles. Personally, I recommend you The Chicken Biscuit the most and this seems the most popular menu. 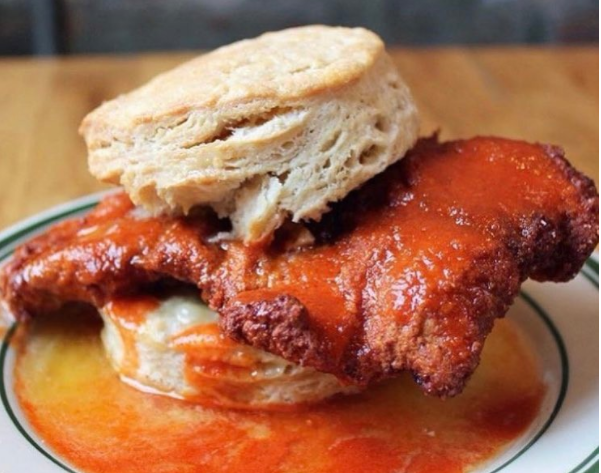 The big chicken is sanded with biscuit and it will excite you. This biscuit is something I should highlight. The baker at Pies ’n’ Thighs, Laura Jawitz, bakes 2,500 biscuits a week and she knows the knack of it. It is rightly buttery but light and even solid enough to be sandwich, which means the biscuit is just made for The Chicken Biscuit. The sandwich is topped with hot sauce and honey butter. All flavors will be combined in your mouth and it is like omg!! 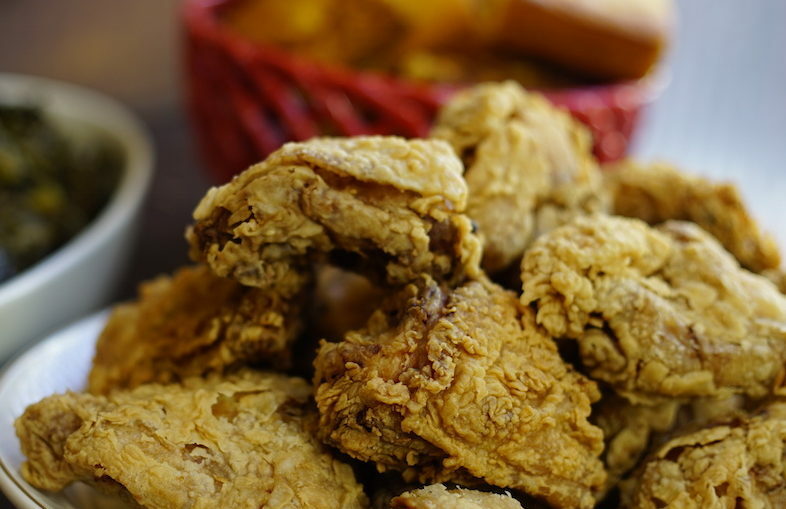 If you want to have your chicken and biscuit separately, you may opt for The Chicken Box, which includes three pieces of fried chicken, a buttermilk biscuit and choice of side. This is what you should have for your dessert. 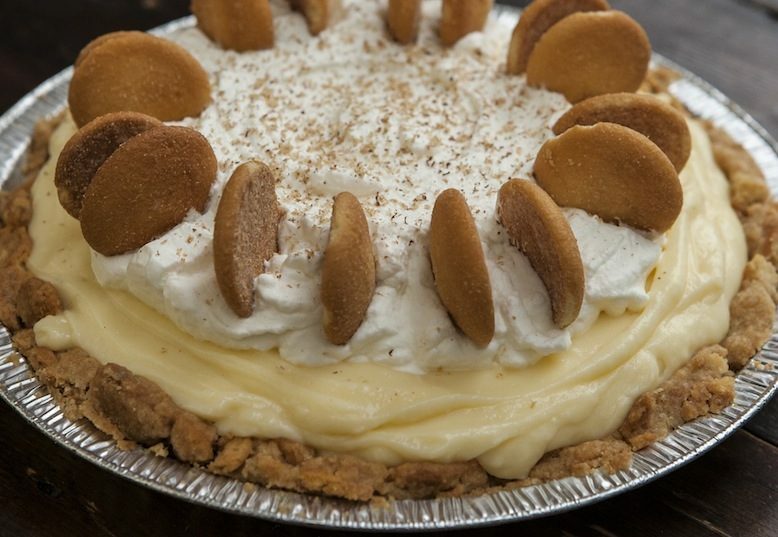 Banana Cream Pie is really airy and light. But it has a thick favor and you will feel like you were eating a real banana. This will be one of the top pies you have ever had for sure. In addition, The Bourbon Pecan Pie will be also a good option. It has a layer of the pecans, sugar and butter. The crust is enjoyable and bourbon flavor makes this pie richer. For eating there, Fried Chicken and some desserts are more than enough. 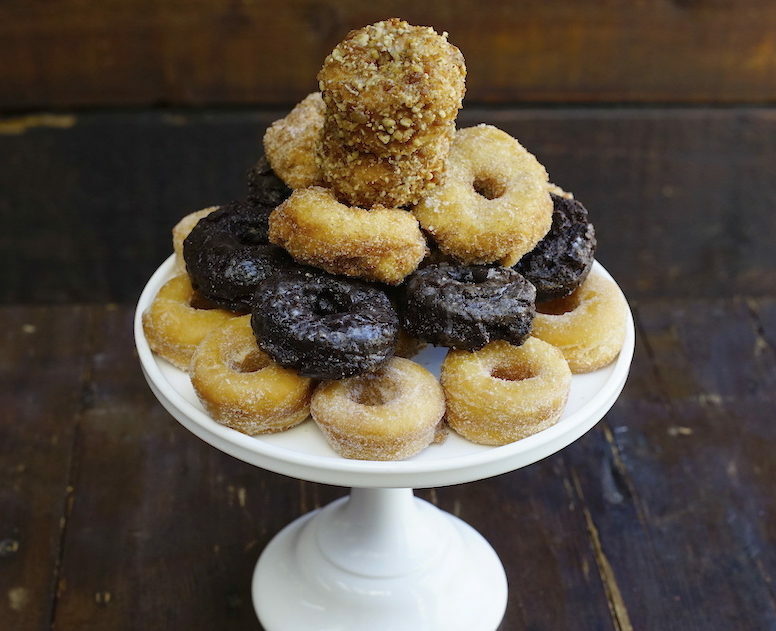 So why not bring back some donuts to your friends, family or work? They will thank you! They have 5 types of donuts and they are moist, fluffy and rightly sweet. All of them should not be missed, however Butter Pecan Crunch is the winner. This has s nice texture and is addictive. It can be recommended to guys who are not that into desserts. They do not accept reservations. So if you go after 5pm, please expect the long waiting line. And there is not a waiting area indoor and benches outside is only for 3 or 4 people. Hence be prepared to stand and wait. If you don’t like it, please go early or don’t go there hungry. The long waiting line can be always a negative point when you visit restaurants. However at Pies & Thighs, the staffs treat you enough well not to let any complaints occur.